Can tech help rehabilitate inmates? Inmates in Singapore’s correctional facilities have been given tablets in hopes that this would work towards their rehabilitation. Under the recently launched Digitalisation of Inmate Rehabilitation & Corrections Tool (DIRECT) project, Singapore’s Prison Service (SPS) believes that recidivism (the tendency of a convicted criminal to relapse into criminal behaviour) rates will drop as prisoners are able to stay in touch with their families, which in turn goes a long way in helping them reintegrate and rebuild their lives after they are released. The initiative had its pilot run involving 800 prisoners back in 2017 across four prison institutions in the country. The tablets are connected to a secure internal network and can be used by inmates in their cells. Three to four inmates are issued one tablet to share for a few hours each day. In a news report back in 2017, Seu Mun Chung, SPS assistant director of technology development and Superintendent of Prisons said that by 2019, all inmates should have access to tablets. At the time, he said the decision would depend on feedback gathered from inmates and prison officers after the six-month trial which ended in September 2017. One of the ways providing prisoners with tablets helps is by ensuring more communication with family members. The SPS noted that previously, inmates and their families had to rely on physical letters and visits to maintain communication. This, naturally, involved a lengthy waiting time. However, Neo Ming Feng, Assistant Director of Transformational Projects told the media that with the tablets, 87.5 percent of family members have sent more letters. This, he said, was also encouraging from a security perspective as it reduces the risk of contraband being smuggled into the prisons. More than just keeping in touch with families, the tablets also aid in inmates’ efforts to improve their education which helps them acquire the knowledge and skills they would need to improve their employability after leaving prison. On the tablets, prisoners can access pre-loaded e-books, e-learning resources, and motivational podcasts even from their cells. Prior to the project, inmates only had limited access to reading material during their library time. A study by the Indiana Department of Correction has found that an offender’s post-release employment is “significantly and statistically correlated with recidivism.” It found that offenders with lower levels of formal education had lower employment rates which also resulted in higher recidivism rates. In 2018, the SPS told local media that the overall recidivism rate for the 2015 cohort of inmates was 25.9 percent, lower than the 26.5 percent for the 2014 cohort and the same as the 2013 cohort. These are its latest statistics. It also noted that more employers have registered with the Singapore Corporation of Rehabilitative Enterprises (SCORE), which matches soon-to-be released inmates to jobs. There were 5,520 employers registered with SCORE in 2017, compared to 5,093 in 2016 and 4,745 in 2015. 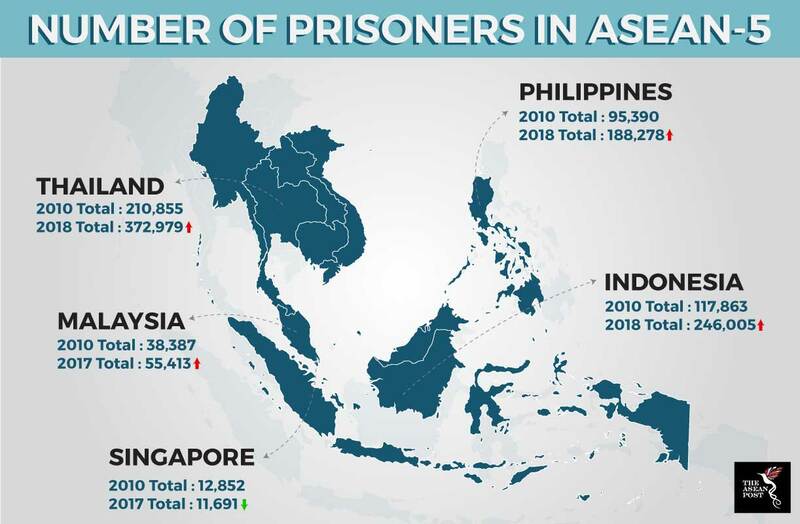 While Singapore’s recidivism rates are not as low as those cited by Malaysia’s former deputy prime minister Ahmad Zahid Hamidi in March last year (7.6 percent), Singapore’s figures are impressive considering the number of prisoners it has. It is obvious that Singapore intends to lower its recidivism rate even further and it believes that tech may be the answer to this. As such, SPS hopes that adopting a three-pronged approach towards expanding its community-based programmes, through enhancing community corrections and practices, strengthening throughcare, and leveraging family and community support will aid in this endeavour. Providing inmates with tablets is just one of the many things Singapore is either doing or intends to do. While it is certainly a worthy endeavour which will hopefully lead to an overall decrease in crime, it will take time before Singapore’s hopes of lower recidivism can be realised. If it proves to be effective, then the rest of ASEAN will have a case study of how to effectively rehabilitate their inmates as well.